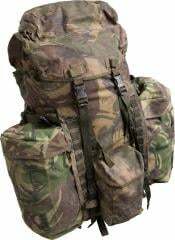 Genuine British Army PLCE-ruck, used condition. An excellent choice whenever a larger rucksack is required. These particular rucksacks are missing their internal aluminium support frames. One can easily be made using flat aluminium bars (the original frame is essentially a TT-shaped piece of metal, so the only things you need are some screws or rivets, and four pieces of flat aluminium (or iron) bars). Even without the frame the rucksack is perfectly useable, you just need to pack smart and carefully.